Hermann Hesse was German-born writer and painter. His greatest works include Siddhartha, Steppenwolf, and The Glass Bead Game. Each of these works explore a person’s search for self-knowledge, authenticity, and spirituality. He was awarded the Nobel Prize in Literature in 1946. Hesse was born in July of 1877 in the town of Calw (Black Forest) in Württemberg, Germany. His parents were Pietist missionaries, as well as religious publishers. Hesse was expected to follow his family tradition of theology. In 1891, he entered a Protestant seminary in Maulbronn, but was expelled. After several unhappy experiences (including a suicide attempt) at other educational institutions, he enrolled at the Cannstatt’s Gymnasium. Hesse passed his one-year examination in 1893, which concluded his education. In October of 1895, Hesse began a bookseller apprenticeship in Tübingen. The shop specialized in law, theology, and philology books which Hesse started reading after his workday. In 1899, he published his first books – Eine Stunde Hinter Mitternach and Romantische Lieder. In 1904, he became a freelance writer when his book Peter Camenzind, a novel which reflected his dislike of the educational system, achieved literary success. That same year, Hesse married Maria Bernoulli, and they settled in Gaienhofen. Over the next few years, they had three children and Hesse wrote his second book, Beneath the Wheel, which was published in 1906. He wrote his next book, The Wolf, in 1906 and 1907. In 1911, Hesse visited India to study Eastern religions and this resulted in him writing Siddhartha in 1922. This novel was centered on the Gautama Buddha’s early life. The ancient Hindu cultures along with the ancient Chinese cultures had a large impact on his writings. Hesse moved his family to Bern, Switzerland, in 1912. During the next couple of years, his wife started suffering from mental instability. His son was also seriously ill. His breakthrough novel, Demian was published in 1919. This was Faustian tale about a man who was torn between his bourgeois lifestyle and a world of sensuality. In 1919, he left his family and moved to Montagnola, a city in southern Switzerland. In 1922, Siddhartha was published and it was a story about asceticism that occurred in the time Buddha. In the 1950s in America, it became a popular spiritual guide for the Beat generation poets. In Steppenwolf, the story mainly reflects Hesse’s profound crisis in his spiritual world during the 1920s. It portrays the protagonist’s struggle with his humanity as well as his wolf-like violence and homelessness. It became a major international success, even though Hesse later stated that this novel was largely misunderstood. In The Glass Bead Game, Hesse presented a biographical parody about the main character, Joseph Knecht, who belongs to an intellectual elite group. Knecht has been obsessive about becoming the master of the glass bead game ever since he was young. He eventually becomes Magister Ludi or the Master of the Game when he becomes an adult. Hesse invented this game as a child when he was doing yard work to keep his mind occupied. Hesse received his Swiss citizenship in 1923. He remarried in 1924 to Ruth Wenger and this marriage ended three years later. These challenging years produced his next work, Der Steppenwolf, in 1927. In 1931, he married Ninon Dolbin, and started writing Das Glasperlenspiel, also called the The Glass Bead Game, and in 1943, it was finally published. This was his last novel, and after he was given the Nobel Prize, he no longer wrote any major works. Throughout the last two decades of his life, Hesse composed several short stories (mostly childhood recollections) and poems. 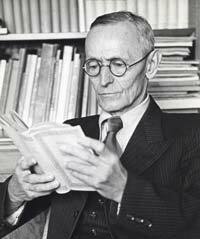 In August of 1962, Hermann Hesse died in his sleep from a cerebral hemorrhage. Today, he is still a bestselling German writer.